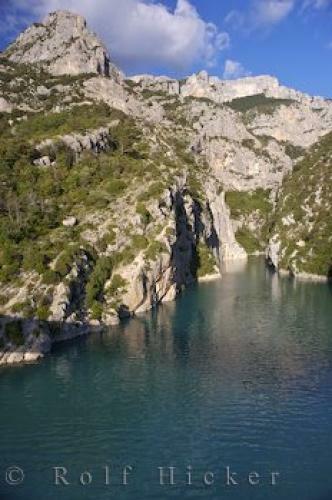 Created through the damming of the Verdon River in 1975, Lac de Ste Croix begins where the majestic Verdon Canyon ends in the Alpes de Haute region of the Provence in France. Though the Verdon River has cut a dramatic path through the Grand Canyon du Verdon (Gorges du Verdon), it enters Lac de Sainte-Croix gently where the canyon walls flatten to a plateau. A popular recreational Lake, Lac de Ste Croix offers boating, canoeing, sailboarding, and swimming opportunities for tourists during the summer months. Prior to Lac de Ste Croix being created through the damming of the Verdon River, the small village of Les Salles sur-Verdon which was originally founded on the banks of the Verdon River had to be moved to higher ground. While the new village now lies on the shores of Lac de Ste Croix (high and dry), the old village is below the water level of the lake at 35 metres deep. A few monumental structures were also moved such as a church bell tower and fountain. The entry point of the Verdon River into Lac de Ste Croix from the Grand Canyon du Verdon, Gorges du Verdon, Parc Naturel Regional du Verdon, Alpes de Haute, Provence, France, Europe. de Ste Croix, Alpes de Haute, Provence, France.